This is the side building of the manor. 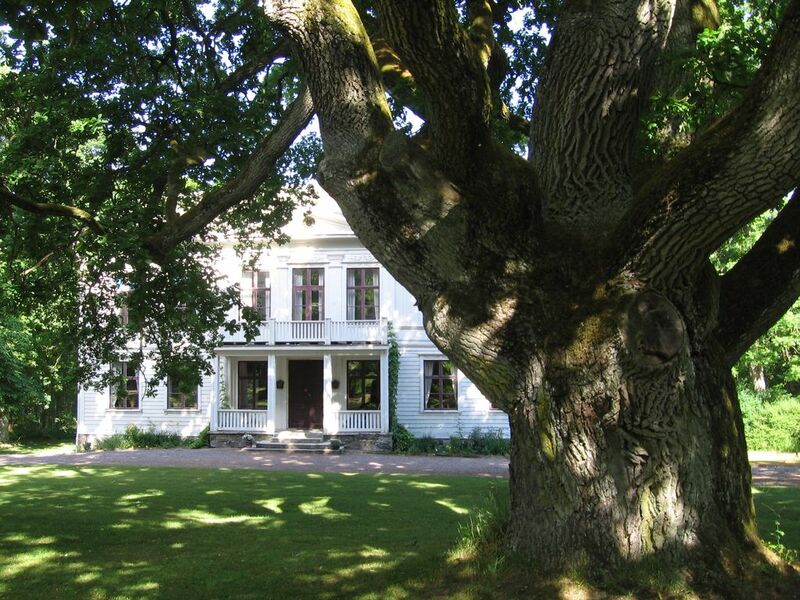 This house is a typical Swedish country house with a harmonious atmosphere originally from the 18th century. Despite this, the house has all modern comfort. It is very suitable for a family holiday. Hjelleskate Manor is an idyllic Manor With one main building (the white building on the Photos) and the flygel ( the red building on the photos) at the lake of Vänern in the county of Värmland, Sweden. This part of Värmland is well known for it’s interesting cultural history with many archaeological funds. Vänern is the 3rd largest lake in Europe, and has a lot to offer its visitors, such as a large archipelago (10.000 islands), beautiful flora, a rich birdlife, sailing and fishing . Hjelleskate Manor is situated on historical ground. Two 4-500 old oakes are standing in front of thehouse guarding its inhabitants. The view over the Väner lake is always changing every evening you may see beautiful sunsets. The atmosphere here is the peaceful contrast to a stress ful life. We had booked the main building for one week. It is a beautiful very large building in a nice setting. However the building is in need of renovation, especially the bathrooms. Unfortunately we encountered quite a number of mice in the kitchen, hallway and one bedroom and decided to leave early due to that. There was another family at the same time in the side building who seemed to be happy with that. If you are contemplating renting, the side building might actually be the better choice. We stayed in the Flygel in the summer of 2013 (I was unable to fill in the correct dates as my review comes a bit late) and I can seriously recommend it. The peninsula is a great place to explore: extremely quiet, many nice bays and beaches. We did a lot of cycling here which is absolutely recommendable. The harbour at the tip has a small restaurant which is fine for a quick meal. The Flygel house is big enough for the six we were with and it lies in a wonderful quiet, green area, next to the historic big manor house. Clean, nicely decorated - recommendable. Der Flygel hat ein volles Badezimmer in der oberen Etage und unten (EG) eine separate Toilette; die 2. Dusche ist im Vorraum der Sauna (auch EG). Unten 1 Doppelschlafzimmer, oben 2 Einzelschlafzimmer und 2 Doppelschlafzimmer. Oben schöne, große, sehr helle Lounge (2. Wohnzimmer) zwischen den einzelnen Schlafzimmern. This part of Värmland is well known for its interesting cultural history with many archaeological funds, beautiful scenery with old Manor Houses and churches. Vänern is the third largest lake in Europe and has a lot to offer its visitors, e. g. a large archipelago (10.000 islands) beautiful flora, rich birdlife, sailing and fishing possibilities. Golf: There are two very beautiful golf courses close to water in the area about 25 km away from the property.